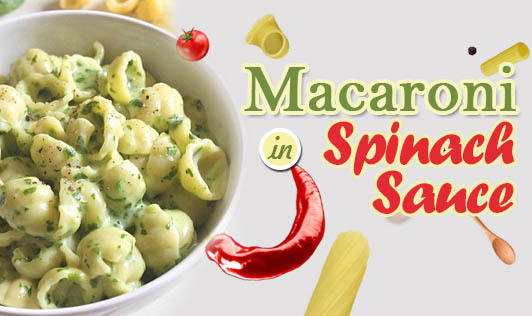 Give a boost of nutrition to your traditional macaroni pasta recipe by adding spinach to it. Your kids will surely love this delicious green pasta. • Boil 6 to 7 cups of water in a vessel, add a tablespoon of refined oil, add the macroni to the boiling water and cook until the pasta is al dente. Drain the pasta in a colander and hold it under running water for a few minutes. • Mix in a tablespoon of olive oil and keep aside. • Heat 1 ½ tbsp of butter in a nonstick pan, add garlic, and sauté for a minute. Now add the maida and sauté till cooked. Make sure the maida doesn't turn brown. Now slowly add the milk and stir continuously till it becomes smooth and creamy. Add the spinach pureee, grated cheese and cook for another 5 minutes. • Now add the macaroni, season it with salt and pepper and turn off the heat. • Garnish with some grated cheese and serve hot.